As a fitting way to culminate the Affiliation Program, four distinguished members of the Affiliation Class present members of the about-to-be graduated Class with their first set of 2LT bars. Engraved on the backs of the brass are the last two digits of the graduation years of the cadet and Affiliation Class symbolizing the ever-lasting connection between these two Classes which has been forged over the four-year Affiliation relationship. 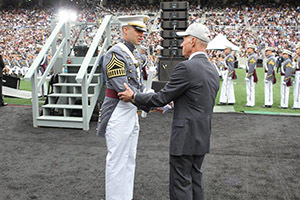 This event is all the more memorable since the presentation of the 2LT bars occurs on the stage as the cadets are leaving the dais after receiving their diplomas. Prior to the beginning of the graduation exercise the Adjutant recognizes the presenters and the 50 Year Affiliation Program in its entirety, demonstrating the importance attached to this program by cadets, the Academy, and the Long Gray Line.